Fantasies can be bad for your Elf. I am not afraid to confess that when I read fiction I like it to be more fantasy than reality based . Indeed Imuch of the content gracing my bookshelves is a fair amount of Sword, Sorcery and Spacecraft paperbacks. So I have Sizemore the more recent collection to my bookshelves. 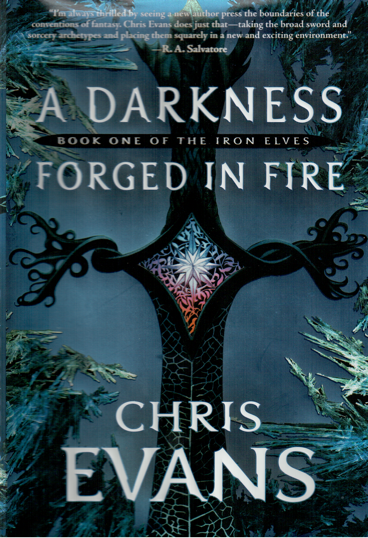 A Darkness Forged In Fire : Book one of The Iron Elves by Chris Evans is the story of Elves who shunned by their own race because they are marked by the Shadow Monarch choose to serve in the Human armies to seek pay for the sins of the heritage. Actually theres an awful lot of backstory and exposition. Basically the Iron part is that they tend to use Iron more than Wood which is apparently frowned upon by most of their peers. So far so sword and sorcery. If your a fan or the Robert Jordan , Bernard Cornwell style of writing specifically with a militaristic bent extended only by overly long descriptive renderings of how a horse is walking or how a Shako ( yes I had to look it up ) was tilted on someones head, then this is going to be your book. One short comment about Elves; I have yet to read a fantasy novel in which Elves are anything other than Humans with pointy ears and a “namby pamby” green theme running through everything from their outfits to their housing. This book did not change that view. If it wasn’t occasionally driven home that the main protagonist had a thing about an oak tree it wouldn’t have mattered.